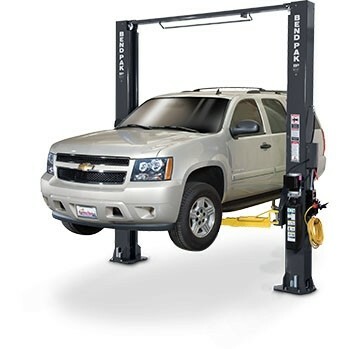 BendPak - 2 Post Lift -XPR-18CL-192 - 18,000-lb. Capacity Two-Post Lifts - Gary Bloom Sales, Inc. 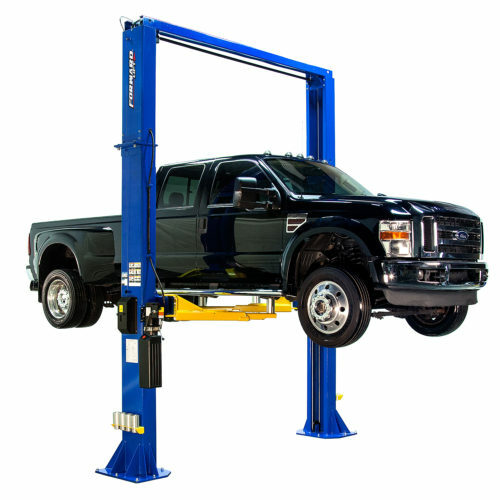 This is the same great truck lift as the popular XPR-18C (standard height model), but with the 2 foot extensions to add height to the columns. This is to provide for added clearance when needed for those really tall trucks that may require extra column height so you can raise the truck high enough to stand up underneath it. Looking to raise big, heavy trucks? You’d better get a BendPak. These super duty models are made for that specific task. They feature extra heavy duty post construction, arms that won’t wilt under extreme loads, and a taller lift carriage to distribute the load over a wider surface area. 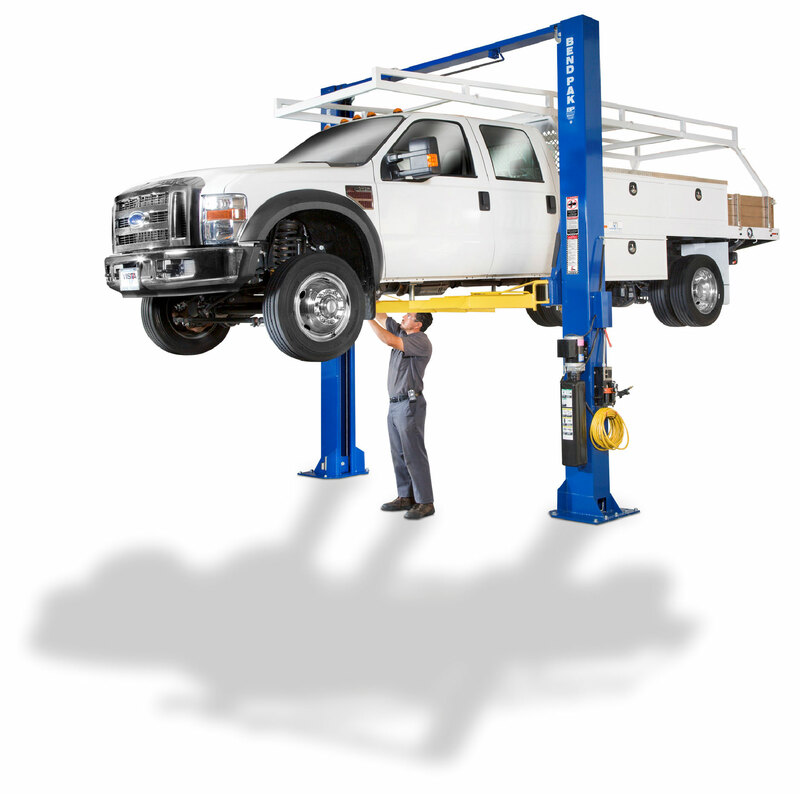 This extra tall model allows you to lift extra tall box trucks and service vans while not triggering the shut-off bar before reaching full lifting height. Requires a ceiling of greater than 16 feet tall. All BendPak clearfloor models utilze Large 5″ diameter cable sheaves to help equalizer cables last longer. 16 load bearings mean less room for movement and less wear in the 53″ tall carriage. You can set these models up at a wide or a narrow configuration. Special arm configurations are available too. The XPR series shows why BendPak is on top. They feature the highest quality components along with meeting the highest safety standards that go above and belong ALI and OSHA standards. No other manufacturer offers so much, for such a reasonable price. A wide array of optional accessories to make your lifting experience safer and easier are available. Of course, the standard features included with each model far surpass most of the competition. 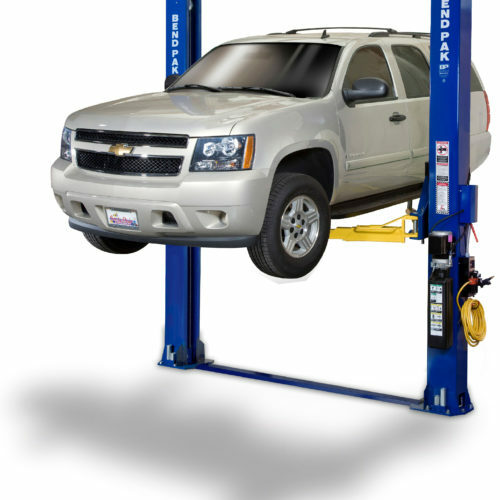 Serious professionals have known for decades that when you purchase a BendPak two post lift, you can count on longevity and reliability. The XPR line furnishes all the tools you need to get the job done on time and on budget. Their reputation for quality and safety are legendary. And they won’t put a dent in your wallet. Free Frame Cradle Pad Adapter Kit – Normally a $180 Value. 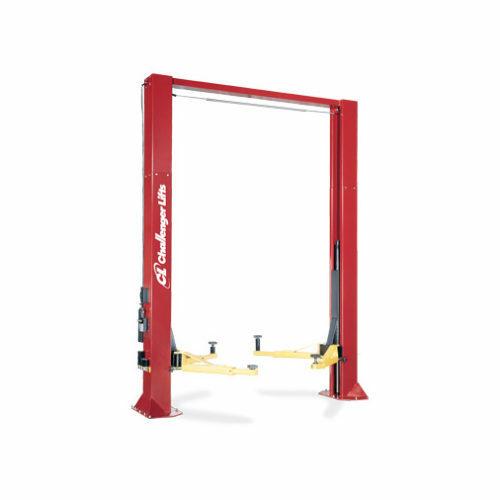 We now throw them in with the purchase of any 12 – 18,000 lb. BendPak 2 Post Lift. Grabs the vehicle’s frame to keep it from slipping off. A definite safety feature. Plus, standard rubber padded contact pads are included, along with 3″, and 6″ stackable pad extensions. Other manufacturers charge extra. They come standard with every heavy truck model. Clearfloor makes work easier – Having the equalizer cables and hydraulic lines pass along at the top of the columns means your floor is clear from obstructions. This allows you to roll tool boxes, oil drains and transmission jacks without worrying about having to careuly pass them over a floor plate.